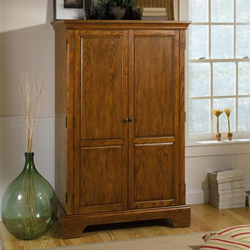 All Riverside® Furniture domestic products are constructed of the finest wood species from American forests. Our preferred hardwoods include red and white oak, ash, poplar and pine...to name just a few. These wood species have been the choice of cabinetmakers for hundreds of years because of their durability and beauty of grain. All trees are carefully and selectively harvested, with strict attention paid to the conservation and re-forestation practices of our harvest forests. The making of any piece of Riverside® furniture begins at our dimension lumber plant, located in Russellville, Arkansas. Here the raw wood is first "graded" to make sure it meets Riverside's high standards for the making of our furniture. The lumber is then slowly kiln dried to make sure that just the right amount of moisture is removed from the wood to help prevent "season splitting" which is the natural result of wood that is either too moist or too dry or exposed to dry or moist conditions in the home. Once the wood is finally ready, it is then sent to one of our three manufacturing plants and two support facilities located in Fort Smith, Arkansas. Construction techniques used with durability and value in mind. Riverside utilizes a variety of construction techniques that allow us to meet the wide range of design and budget requirements of our customers. The construction of the core product line consists of a combination of cabinetmaker hardwood solids and hand-selected veneers. The use of these two hardwood materials allows us to design investment quality furnishings that are not only beautiful but will increase in value through the years. Riverside¹s HomeCraft® furniture products are constructed of engraved wood elements. This construction technique begins with a realistically duplicated wood grain pattern that is engraved into durable multi-density fiberboard (MDF) panels under thousands of pounds of pressure. These panels are then finished in the same manner as products utilizing solid hardwood veneer construction, with the additional application of our Novagard® Protective Topcoat finish. HomeCraft® products are the choice of customers who want fully assembled, beautifully designed furnishings that are more economically priced. It¹s the cabinetmaker¹s choice for making drawer joints that won¹t pull apart over the years. Riverside® craftsmen dovetail joints both in the front and the back of the drawer. We spend a little more time here so that drawers will hold ³stuff² for years to come. We take great pride in the little things...like how easily a drawer opens and closes. Heavy duty steel roller guides offer superb weight-bearing capability as well as smooth operation. Many drawers and doors, like the file drawers in desks, pocket doors in armoires, and printer and keyboard trays in computer workcenters, feature premium heavy-duty drawer guides that provide extra heavy-duty weight-bearing capability and effortless opening and closing with ball-bearing extension slides. You¹ll appreciate the multiple-step application of Riverside¹s furniture finishes. You see, the more hand operations there are in the application of a finish on a piece of furniture, the deeper and more lustrous the finish will remain during the lifetime of its enjoyment and use. Our finishing processes involve several steps of hand sanding, applications of several types of finishing coats, padding and polishing. Again, each piece of Riverside® furniture is inspected before being allowed to be packaged with our inspector¹s stamp of ³Quality First!² approval. By the way, our quality inspectors are so proud of their work, that they put their own names on the Riverside® quality inspection tag that you¹ll find on every piece of furniture we make. Now that¹s taking pride in a job well done! Again, each piece of Riverside furniture is inspected before being allowed to be packaged with our inspector’s stamp of "Quality First!" approval. By the way, our quality inspectors are so proud of their work, that they put their own names on the Riverside quality inspection tag that you’ll find on every piece or furniture we make. Now that’s taking pride in a job well done!